“I would like to share with your readers a sad case that took place more than 3 decades ago of a girl who hanged herself on October 28, 1982, at about 7-08 pm. (1ST) in Calcutta as per the postmortem report. The girl was an M.A. in political science and was preparing for her doctorate. She got acquainted with a man in November 1976 during her Mars Bhukti Jupiter Dasa. She fell madly in love with him. The man was a libidinous character staying away from his wife and only child of which the girl was not sware. The man took the girl to his house many times and occasionally they stayed there overnight too. From November 1981 (Saturn Bhukti Saturn Dasa), the relationship turned a little sour since the man kept evading any talk of marriage. When the father of the girl came to me about her marriage in February 1982, I apprehended that Mercury Bhukti in the Dasa of Saturn could be fatal. She was staying with the man on the last 3 days before her death, which occurred during Mercury Bhukti in Saturn Dasa. The chart is full of several appalling indications” writes a reader from Kolkata. “The girl has her Moon in Libra in Jupiter Trimsamsa which, according to classical writers, makes her noble, generous and virtuous. What is intriguing in this case is the girl’s involvement with a married man which belies some of the results attributed to a Jupiterean Trimsamsa. Even if she had married the same man, her premarital adventure, especially in those days was not acceptable to society in our country. 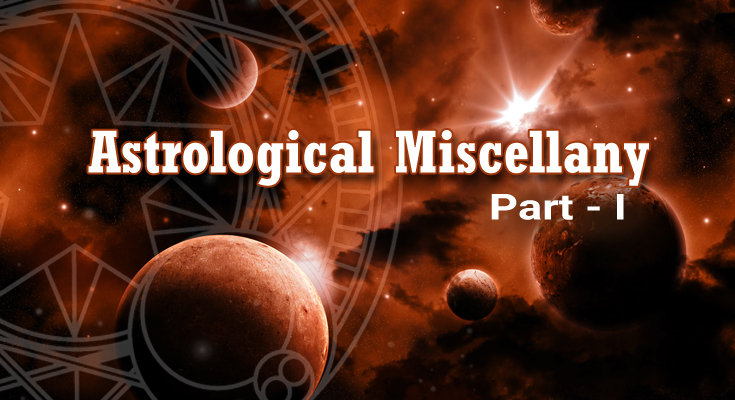 “Mars, a first-rate malefic in the 7th in a dual sign, the 7th lord in a dual sign aspected by a malefic, the 7th lord from the Moon also in a dual sign and the Ascendant lord Mercury’s association with the heterodox Rahu are partly responsible for the girl going astray. What fanned these factors is the Moon-Venus combination adversely aspected by malefic Mars. Venus occupies his own sign Libra so that the girl had a choice in the matter in the early stages. She could have decided to wait until marriage before getting physically involved with the man. It was not the same as if she was forced into the relationship. This disposition of Venus also gave her a one-man relationship while the Moon joining him made it intensely emotional, even if from only her side. The adverse aspect of Mars on the Karaka denied the girl marriage giving the whole episode a sordid shade. Readers are welcome to send in their views on the girl’s untimely and unhappy death. While on this depressing topic of disenchantment, we have the chart of another lady who was sucked into the flesh trade. As it invariably happens in such cases when the girl discovered she had no options in life, she doused herself with kerosene and burnt herself to death. Chart 2: Female: Born September 21, 1955, at 6h.30m. 1ST at 12 N 18, 76 E 42 with a balance of 2 years 22 days of Jupiter Dasa at birth. The native of Chart 2 was born in an orthodox traditional middle-class family. Life was happy and peaceful until about 1978 when (the details are not available) she was forced into the world’s oldest profession. Mars is in the 12th as a malefic and can give horrid overtones to the signification of this Bhava, namely, Sayanasuka. The Moon rises in Mars Trimsamsa with Rahu in Scorpio. Such a disposition of the Moon warrants her plight. Kalatrakaraka Venus is in Virgo with the 12th lord Sun and caught in a Papakartari Yoga. The 7th lord Jupiter is exalted but in the 11th house. The 7th lord Venus (as reckoned from the Moon) is debilitated also in the 11th therefrom in a common sign. Naturally, the girl had to appease many wolves. In the case of Chart 1, the Moon is well-placed. The girl was happy doing whatever she did. In Chart 2, the native literally suffered hell forced to do what she could never have liked with all and sundry. 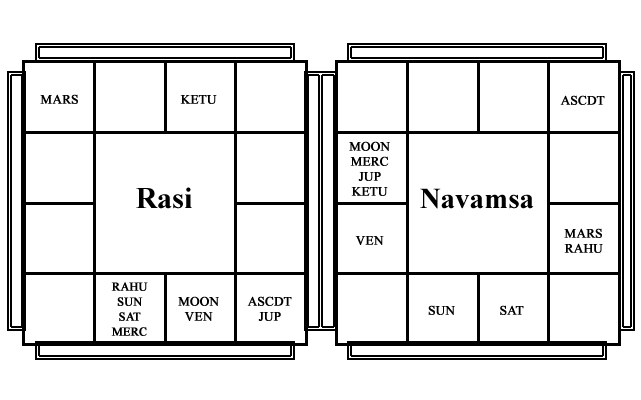 The Moon here is in a Keeta Rasi with Rahu aspected by Mars. Jupiter does aspect the Moon but here too, as, in Chart 1, the Dasa was of an ill-placed planet, Mercury. Being the Ascendant lord, he is with malefic Saturn. He is in a Parivartana Yoga with Venus who is in a Papakartari Yoga. He occupies the constellation of a malefic Mars. The girl was caught in a life she hated, in circumstances that offered no freedom. We may incidentally note, how Mercury joins Saturn, the clandestine planet. The girl’s family never suspected her agonies which she kept to herself until the post-mortem report and developments shocked them into details which they would never have believed otherwise. Readers are welcome to send their comments on this tragic case. According to Bangalore reader B.V. Raghunath “Saturn is in Cancer in an inimical sign. Saturn is aspecting the Ascendant where the 11th lord is placed with Rahu which has impacted his education. “Saturn aspected by Ketu impacts married life also. The 10th house from Saturn is occupied by Mars and Venus. Mars is in his own house which means the female is stronger than the male and the dominating attitude of his wife has lead to divorce. Since Mars and Venus are in the same house, the native has been married early. The native can get married after six months if he tries. 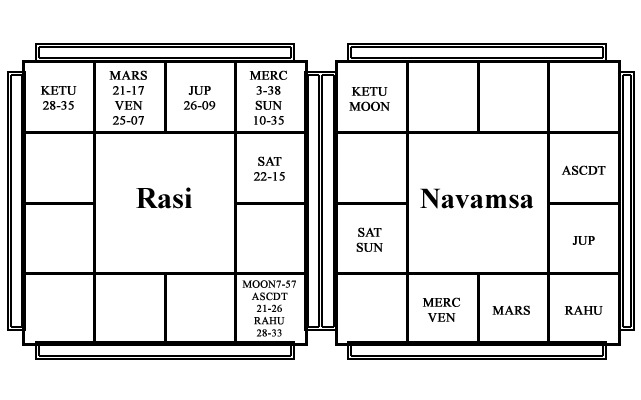 Reader S.Lakshmanan of Salem sends in a Table of the Dasas with their ending dates and the net Balas of Dasa lords. “Venus and the Sun get Balas of 0.46 Rupas and 0.74 Rupas respectively; hence, during their Bhuktis the native may see beneficial results. The marriage may take place during the conjoined Dasa Bhukti period of the significators of the 2nd [ additional member to family], 7th [spouse] and the 1 the [gain] Bhavas. They are Venus, Jupiter, Ketu, Saturn, and the Moon respectively. “Jupiter Dasa is running. Hence during Jupiter Dasa Venus Bhukti, the native’s marriage can take place between April 9, 2021, and December 8, 2023, and in particular, at the end of March 2022 when transit Jupiter will be in Aquarius and before he moves into Pisces. “The Lord of the Ascendant Mercury is placed in the 10th house combust and in own house Gemini. Though the Ascendant lord is strong, the Ascendant carries some malefic aspects which cannot be ignored; firstly Saturn has a longitudinal aspect on the Ascendant point; Saturn is the 6th lord aspecting the Ascendant point which shows resistance in life and not getting appropriate opportunities. Saturn slows down or frustrates the progress of the native. Secondly, Jupiter who owns the 7th house, a Badhaka house, aspects the Ascendant point which shows obstructions in one’s progress. Thirdly, Rahu is in the Ascendant very close to it. A strong Ascendant lord always gives good morale and fighting spirit. “For career matters, primarily it is the 10th and 6th houses (9th from 10th), the 2nd house for finance, 11th house for income from the profession and the 7th house as per Bhavatbhavam. The 10th lord Mercury is in the 10th in his own sign with the Sun in a dual sign which shows more than one engagement in a career. Mercury in the 10th shows career related to accounts, audit, voice (Vanikaraka) which confirms engagement in theatre. The strong 9th house makes one fortunate enough to get what one wants without any resistance. Here the 6th lord (9th from the 10th) Saturn is placed in an inimical sign which weakens Saturn; hence the native faces many struggles in his career. Financial conditions come under the 2nd lord Venus who is in the 8th in a neutral sign with Mars showing unwarranted expenses. The aspect of Saturn shows financial slowdowns. However, the 2nd lord Venus aspecting the 2nd house shows some relief. 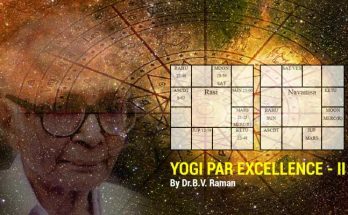 The 11th lord Moon is in the 1st house in a friendly sign and gives income but Saturn in the 11th house in inimical sign gives resistance and impediments in getting money. 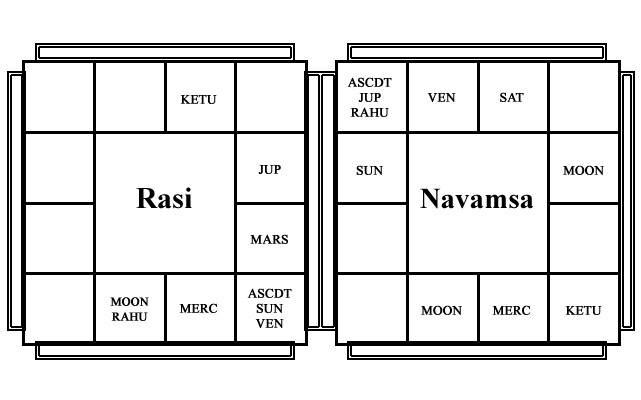 Do you know about astrological houses? The native cannot dominate negotiations when it comes to remuneration in any activity. The 7th lord Jupiter in inimical sign and Ketu in 7th can show no job satisfaction, which makes him leave the job abruptly with losses. Summing up, the native has good willpower and fighting spirit; however, he lacks proper opportunities and faces disappointment. The native must not over think on the issues but take decisions fast; over-thinking may make him lose the opportunity. 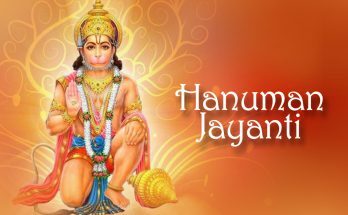 “Jupiter Dasha Mercury Bhukti is from September 2018 to December 2020. 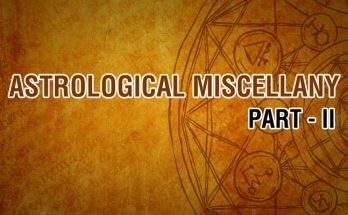 Mercury is the 10th lord placed in the 10th; hence this period will help the native to find good opportunities in the job and theatre-related activities. Further, Jupiter is transiting through the 3rd house and aspects 10th house. Transit Saturn also aspect the 10th house till January 2020. Therefore, the period between October 2019 to January 2020 is favorable for getting a good job.